DVDs may seem a bit old fashioned for young people. However, even for today, DVDs are the easiest tool to store physical copies of your favorite movies, TV shows and even special moments in your life. However, DVDs can be easily broken, lost and scratched. Therefore, DVD conversion tool is invented to copy DVDs to digital formats. 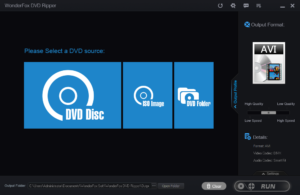 WonderFox DVD Ripper Pro is one of the alternatives to copy the contents of the DVDs to any format and any device that you want. Convert any DVD to a large number of formats and devices. Copy DVDs at a very high speed. Remove the copy protections and copy the protected DVD. Resolve issues that are found on scratched DVDs. Edit videos and add special effects. Extract audio and / or soundtracks from DVDs. 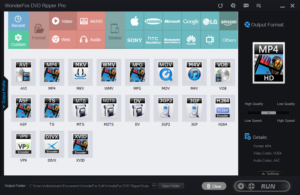 Before conversion, you need to download and install DVD Ripper Pro.Then you can convert DVD content only with 3 steps. Choose a DVD source to load the DVD by clicking on “DVD Disc”, “ISO Image” or “DVD Folder”. Choose an output format in the upper right corner. Choose the output folder to save video files and click on the “Run” button to start the conversion. WonderFox is equipped with huge amount of formats and devices. You can find the format or the device that you want easily. Besides, it’s also able to add special effects to the output video. You can create your own videos. It also allows you to combine multiple videos into one. This software is aimed to offering a simple solution. In fact, anyone can perform this operation without having particular knowledge in DVD converting. The interface is very simple. Here’re also some flaws. This software only supports few languages. Of course, English is supported here. Besides, it’s not available for Mac and Linux system.